Costa Rica, in Central America, might be a small country but it packs a seriously big punch when comes to adventure, wildlife and nature. It’s also one of the happiest countries on earth. Costa Rica is bordered by Panama to the South and Nicaragua to the North. 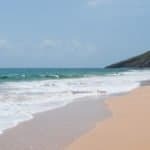 Its location between the Pacific Ocean and the Caribbean Sea means there are two contrasting coastlines to discover and a whole lot more in between. Our Costa Rica adventure covered everything from high altitude cloud forests, jungles and rainforests to beaches and volcanoes. 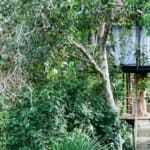 Waterfalls and canopy walks took our breath away and the wildlife watching was epic. We spent an unforgettable two weeks in Costa Rica – here are some of the highlights. Exploring the great outdoors has me right in my happy place. Although Costa Rica is a small country it has a diverse range of landscapes to discover and it’s all doable by road (just!). After spending a night in San José we picked up our 4×4 hire car and set off on our Costa Rica road trip. You know how we love a road trip! 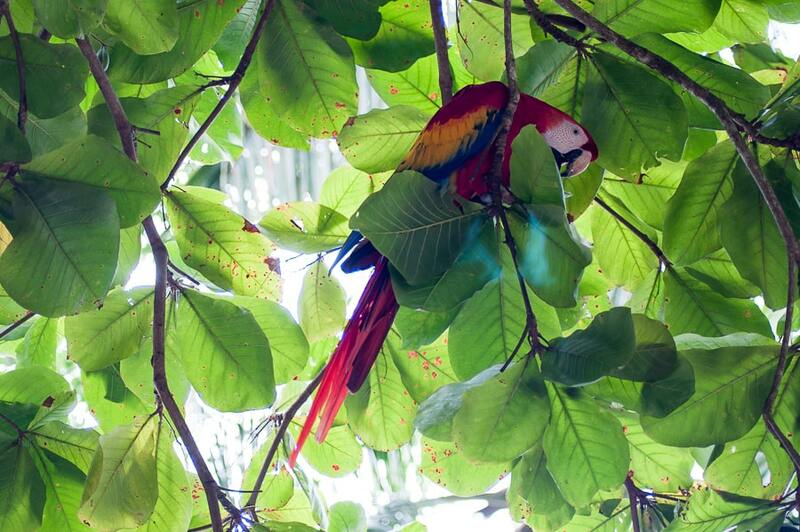 Journeying through jungles, cloud forests and volcanoes we discovered that Costa Rica is a nature lover’s paradise. Rainforests enveloped us as we hiked tree-shrouded trails and traversed hanging bridges. We gazed across the continental divide amid the misty cloud forests of Monteverde and sought out secluded waterfalls. Arenal Volcano loomed in La Fortuna and the white sand beaches of the Pacific beckoned. I found myself constantly enthralled, captivated, and at one point deep in the jungle, in the dark and well out of my comfort zone. Costa Rica ticked the adventure box big time. Costa Ricans or Ticos, as they sometimes call themselves, are some of the friendliest and most genuine people I’ve met on my travels. Always eager to chat about their country and learn about ours we had many local encounters on our trip with friendly, welcoming Ticos. But it was more than that. The Costa Rican people inspired me. Their passion for the environment, wildlife and their commitment to sustainability is something we could all learn from. Costa Rica aims to be the first carbon neutral country in the world by 2021. Currently almost 93% of its electricity comes from renewable sources. 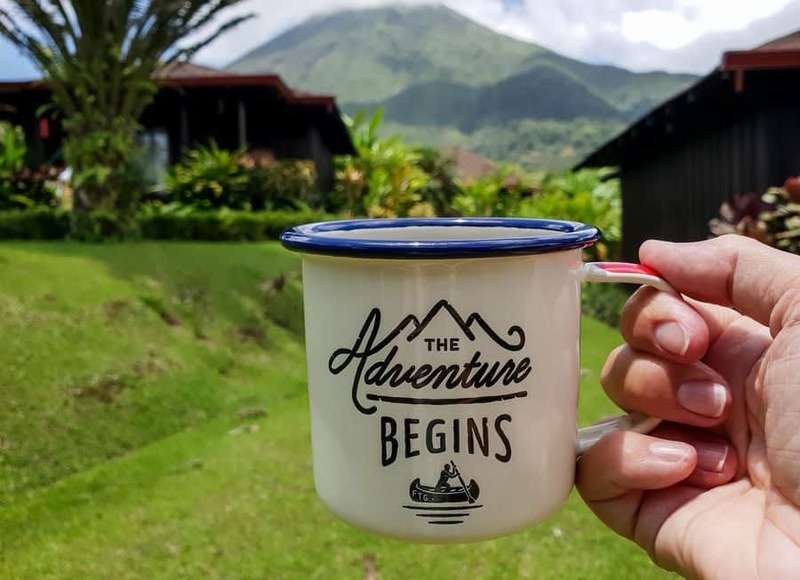 Sustainability is at the heart of Costa Rican culture and tradition and it’s something that’s stuck with me and inspired me to make changes in my life now I’m back home. Oh my, the wildlife! 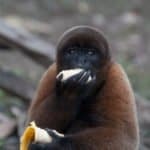 The amount of wildlife in Costa Rica was astounding and all living as it should, in its natural habitat. 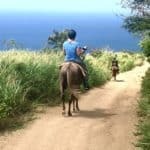 From exploring the cloud forest, a night walk in the jungle to just relaxing on the beach or walking down the road we met an amazing wealth of wildlife in Costa Rica. We learned enormous amounts while trekking through the national parks. Guides would point out animals, birds and insects from the most unlikely places. A row of bats clinging to the underside of a tree stump, a toad peeping out from a hole in a bank or tiny brightly coloured tree frogs. We’d have walked straight past the camouflaged frogs without a second glance if it hadn’t been for the guide. Obviously not the frog below who wasn’t shy at all! It wasn’t just little critters we met. Every day we came face to face with wildlife on land, in the skies and in the ocean. We spent ages watching monkeys, watching us, watching them. 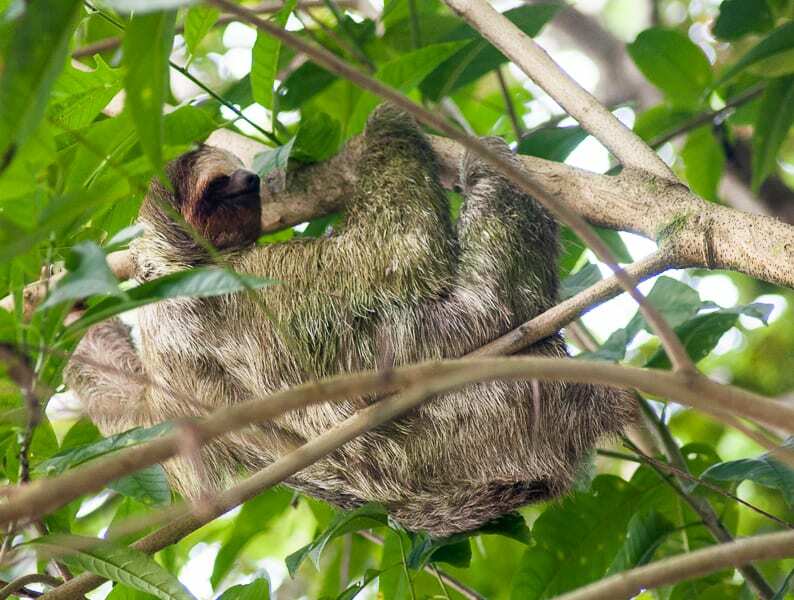 Sloths, two and three-toed, hung out in the trees above us. We even saw a kill as an iguana ran down a tree and took out a huge scarlet caterpillar on the path right in front of us. Sitting on our hotel balcony near to Manuel Antonio national park we watched a troupe of around 30 Squirrel monkeys playing in the trees each day. We woke to the distant bellowing of Howler monkeys and spied well-disguised iguanas basking in the trees. Humpback whales wowed us as we took to the waves. We encountered the full on technicolour of Scarlet Macaws soaring the skies and Halloween Land Crabs criss crossing the rainforest floor. 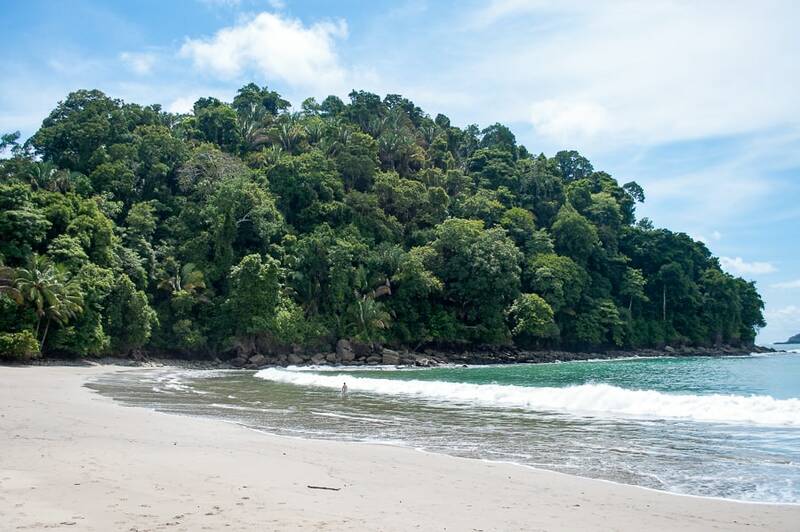 Costa Rica is home to 28 National Parks, three of which are UNESCO World Heritage Sites. 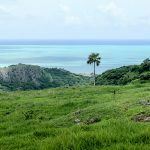 It’s a world leader in conservation and protected areas cover over 25% of its total landmass, the highest in the world. We visited three National Parks during our trip. Each very different from the other. 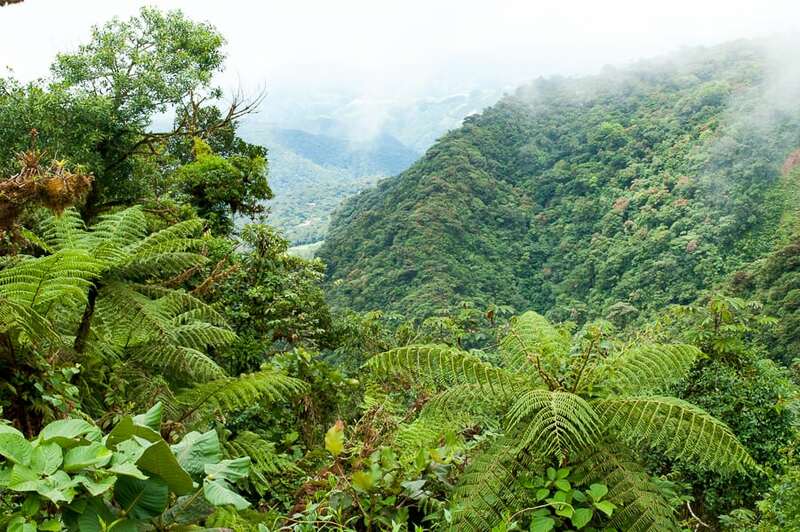 Monteverde Cloud Forest is swathed in misty clouds and home to around 2.5% of the world’s biodiversity. 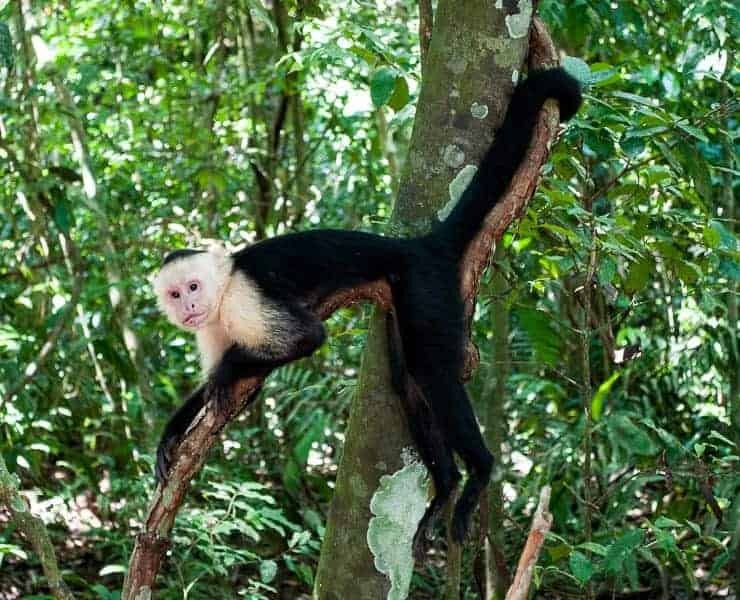 Manuel Antonio brought us phenomenal amounts of wildlife, stunning beaches and jungles which stretched right down to the Pacific Ocean. Everywhere you go in Costa Rica you’ll hear the words Pura Vida. It’s a welcome, a farewell or ‘it’s all cool’ and everything in between. Pura Vida is Spanish for pure life but in Costa Rica it means so much more than that. 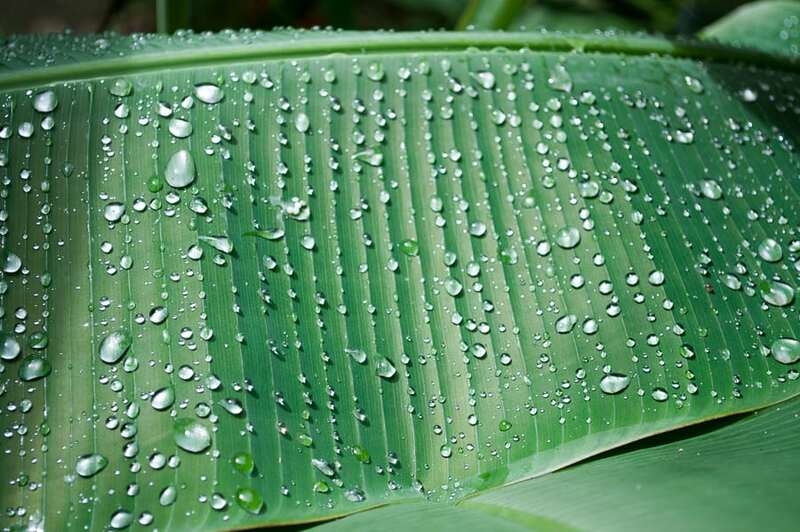 Pura Vida embodies the Ticos appreciation of life, taking the time to enjoy simple pleasures and protecting their environment. It’s no surprise that Costa Rican people are regularly ranked as the happiest on the planet. They also have one of the longest life expectancies. Not a day went by on our trip without being totally wowed. Costa Rica captured a piece of my heart – hardly surprising with that magical mix of beautiful environment, lovely people, a caring, sustainable ethos and wildlife in abundance. Here’s to Pura Vida! This is the start of my Costa Rica series. I’ll be adding to it over the next few weeks with posts on our two-week Costa Rica itinerary. There’ll be posts on what to see and where to stay in each area we visited. These include Arenal, Monteverde, Punta Leona and Manuel Antonio. If there’s anything you’d especially like to know just get in touch. I don’t do skiing, Suze, so I thought I’d come and share some sunshine. 🙂 🙂 I’m sure you won’t mind. Viveka’s right! You write a great piece. Where to next? Costa Rica saved our extended journey through Central America. By the time we arrived in Costa Rica we wanted to get out of Central America because of a series of bad experiences. But after experiencing stunning beaches and the natural beauty of CR, our spirits were lifted. And yes the COFFEE. Your post always amazes me … I wish I could write like you … and your images are getting just better and better. Have heard that Costa Rica is the closest to Paradise we can come. Love that little frog. Truly enjoy … your posts. Thank you so much! Costa Rica is amazing – so much beauty both in the country and the people and the nature is incredible. I think you write beautifully Viveka. I had for many years a colleague that are from Costa Rica and he were dreaming about one day return home and build on his plot of land. Don’t have clue were he are just now. I have read so much about Costa Rica and seen programs. They all say it’s the closest to paradise we can come. Thank you for your kind words. I loved following your trip on social media, can’t wait to read the rest of your posts! Thanks Sally, loads to come still because there was so much to see and do. Such a wonderful trip!